Many years ago, at school, I was a reasonably good runner. 1500 metres was probably my best distance; the 800 metres was too fast for me. Likewise, at the sprint distances I could compete at 200 metres but got left behind at 100. I left school and, like most people, no longer had any reason to run. I discovered walking was a good way to get into the hills so that I could camp but running seemed a strange thing to do unless being chased by a hungry lion. I ran occasionally but knew that I was Not A Runner. I entered my first Parkrun about 18 months ago. I wanted a structured way of getting a little bit fitter. 5 km at a set time every week appealed to me. Run, jog, walk, volunteer – it sounded so inclusive. Although slightly mistrusting my Ultra and Triathlon running friends’ evangelising, I took the Parkrun plunge and waddled my way round the park. Everyone was so supportive and friendly. Not only did nobody care that I was having to walk more than half of the 5 km and had turned the colour of a beetroot, they seemed genuinely delighted that I was there. All of the marshals waved and said hello as I sweated my way round the course. The fast people cheered me on as I approached the finish funnel. There were all sorts of people; big, small, old, young, plus kids in pushchairs, and dogs. Everyone having a go and pushing themselves in their own way. It took months before I could run the whole 5 km without walking but Parkrun not only gave me the environment to develop my stamina and speed, it also helped me to see that running might be fun! I’ll never be fast – and I hate the first kilometre – but I do like the feeling at the end of a Parkrun when I know I have tried my best. Maybe my time was relatively slow but I managed to keep going. My best times seem to be when I’ve had something on my mind and my body has done its own thing without my brain interrupting; it’s great thinking time. Anyway….. that’s how I decided that I’d like to go for a run in the countryside rather than round the park. My aim is to be able to enter an LDWA challenge event as a runner rather than a walker. I walk too slowly to complete the longer LDWA events within the allotted time but maybe if I travelled lighter and quicker I could cover the distance. In the summer I bought myself a backpack designed for runners. It’s like a waistcoat which has small stretchy pockets on the front and a bigger, zipped stretchy pocket on the back. I’ve lost the label so can’t remember exactly what capacity it is but I managed to squeeze a waterproof jacket & trousers, first aid kit, foil blanket, head torch, 1 litre of water (in a bladder), spare long-sleeve top, Polartec headband, buff & gloves and a few snacks into it. Oh, and a map and compass, of course, although I navigated with my phone. Fully loaded, I still felt so light and free. I know I have a tendency to overpack even for a short daywalk but I can’t think of anything I needed which I hadn’t packed. Of course, you can’t be certain what emergency equipment you’ll need until disaster strikes but I knew I could keep myself warm and dry, and peep on my pack’s built-in whistle until help came if necessary. Parked at Llandegla I started off by running on Offa’s Dyke Path along the road and tracks. Easy running under foot, although I may have walked a couple of the uphill bits on the road. The weather was perfect; dry and slightly misty. The forecast said that the rain would stay away and I was hopeful I’d be fine in my Ron Hills and bright yellow Aldi windshirt. The running became trickier once I’d moved onto the moor. The path was either a narrow sheep trod or disappeared altogether. I tried to run when I could but I wasn’t able to see the ground beneath the heather and didn’t want to risk twisting or breaking an ankle. I picked my way through the bog and took the opportunity to run whenever the terrain smoothed itself out. Whilst the weather was dry, the ground was wet and my shoes and socks were soon soaked. No surprise there. I was running in my Inov-8 Terroc 330s which are my walking shoe of choice, so I’m used to wet feet. What I hadn’t really expected was the effect of the water on my Ron Hills. Wicking up the water from below they became heavy and started sagging round my bum and thighs. I think I might need to buy some running tights. Or do runners use gaiters? I’d not intended to stop for refreshments until I got back to the community run shop/cafe in Llandegla but when the Ponderosa came into view I couldn’t resist dropping down the hill for a cup of coffee and scone. Usually I park there when I’m on a day walk, so it felt different to drop off the hill – under my own power – then move on again after my snack. 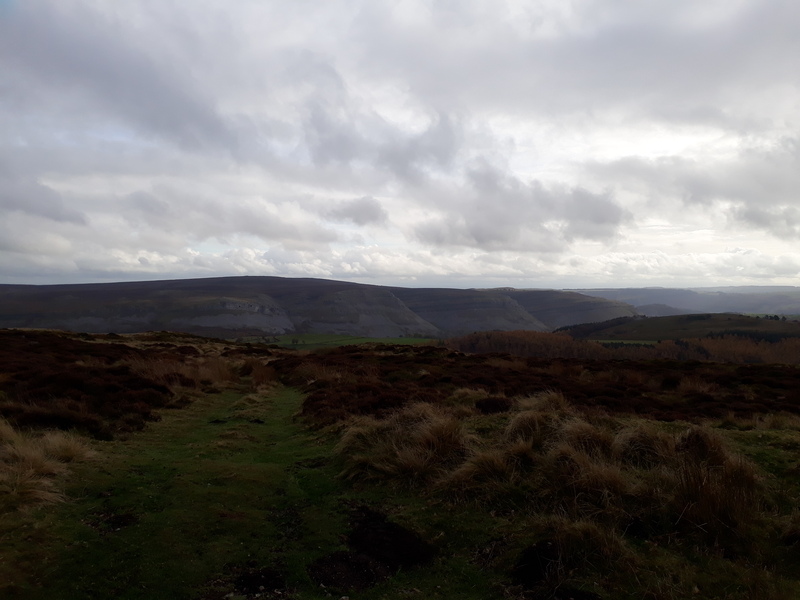 I climbed the hills up to the two masts then picked my way East across the pathed / pathless boggy stuff before rejoining the ODP through Llandegla Forest. My balance has never been good and I noticed that my running style on rough downhill parts seemed to be a cross between a drunk penguin and a Charleston-dancing Flapper. Knees bent, arms down by side, hands stuck out and maintaining a slow centre of gravity. In total I covered 19km in about 4.5 hours and I was probably running / jogging for about half the time, so not fast but I would have been slow on the boggy bits whether I’d been running or walking. It was an enjoyable trip. I felt mentally unburdened by carrying a lighter pack and having come out with the plan to move lighter and faster. I’ll definitely do it again but, even if I don’t set out with the intention of running, I think the day helped me think about my approach to walking and that should help me to be a little less constrained by my “essential” gear and clothing. This entry was posted in Gear, Walking and tagged LDWA, llandegla, parkrun, running. Bookmark the permalink. Well done Judith! I’m delighted that you seem to have avoided the competitive ‘thing’, you’re running your own run. Excellent! If I can keep up with you I’d love to join you on on a little cross-country / hilly run sometime. That sounds good, JJ, as long as we agree that “buggerit, let’s have a cuppa” is a perfect outcome! A cuppa (or an apres beer) is ALWAYS the perfect outcome! Interesting. One of my ‘aims’ is to be able to run (most) of my longer walks from home, over mixed terrain, with undulations and the occasional ford. When my current shin splint is fixed, flippin’ thing. I hope you get your shin splints fixed. You’ll enjoy that sort of run. I’ve gone back to my long walks in the meantime as walking doesn’t aggravate it. I am looking forward to my trail plans. Did I just say that?! Oh dear. Maybe you should ask for a medical opinion, just in case. I’m going to get round to going to see about my wierd leg pain soon, honest! Was it awkward running with a pint pot in your hand. On the other hand, well done, I never had you down for a runner in that capacity. What does the future hold now. Don’t worry, Alan, I’m still not A Runner; I might just go for a run every so often! Thanks Stan. The off road running certainly gave my joints more variety to deal with. Every step was different.